Strindbergian in intensity: Chris McCormack reviews Donnacha Dennehy and Enda Walsh’s new opera. 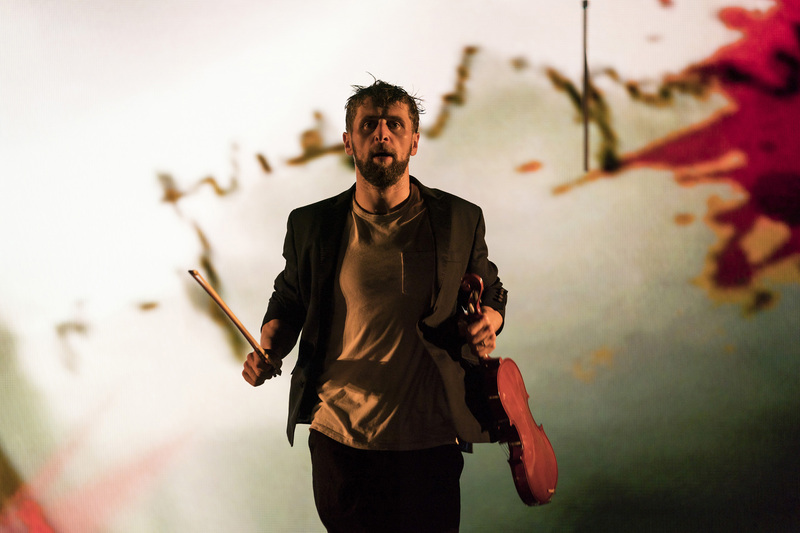 Aaron Monaghan as Martin in The Second Violinist at the Galway International Arts Festival. Photo: Patrick Redmond. How do you heal from heartbreak? There’s no easy answer in Donnacha Dennehy and Enda Walsh’s thrilling new opera which follows Martin, a mute violinist (Aaron Monaghan), coming and going from his apartment. Dodging phone calls by family and colleagues, he turns depressingly inward, where hurt feelings are roused into something dangerous. Inspired by Carlo Gesualdo, the Italian Renaissance composer who executed his own wife, Walsh’s painstaking production for Landmark Productions and Wide Open Opera translates inner turmoil into an electrifying new work. Jamie Vartan’s surreal set allows Monaghan’s physically eloquent Martin to traipse the inertia of everyday life, from his couch to the bus, whilst high and out of reach lies a woodland of un-leafed trees. If that’s not a stark enough metaphor for lust and desire, Martin changes his dating bio from second violinist to composer. It’s astonishing to see the absurd emojis and notifications of our lives fold into something transcendent. The action unsettlingly oscillates; one minute we’re watching a bloody nature documentary, the next a bourgeois wine party. Just as restless is Dennehy’s score, pounced on by conductor Ryan McAdams, which sends strings and pianos spiralling in nervy rhythms and decadent melodies until they, like the production itself, frighteningly lose control. The Second Violinist, it turns out, is as much a portrayal of isolation via love rather than through the absence of it. Soon arrives an agitated husband (Benedict Nelson) and a fraught wife (Sharon Carty) commenting on their latest renovation, which, in Walsh’s elegant libretto, warps into a dark and stultifying realm. Carty, sullenly realising the brittle state of their marriage, observes her visiting friend (Máire Flavin) as if an epic figure from mythology. These insecurities and desires are Strindbergian in intensity. Rendered into operatic format they become overwhelming forces. But Dennehy and Walsh’s characters remain hopeful for renewal, despite the crimes that take place. Nelson’s insecure husband, for instance, reflects poignantly on the migrating swallows and their easy escape. If anything, this sublime production insists on forging a cautionary tale for modern times. Jack Phelan’s arch video design shows an online conversation with a stranger named Scarlett (Alyssa Heffernan) that eventually paves the way for a potentially horrific meeting in real life. A classic fairytale gets imbued with fresh warning: be careful of who you meet when strolling in the woods. The Second Violinist premiered at Galway International Arts Festival. Click here for more details.